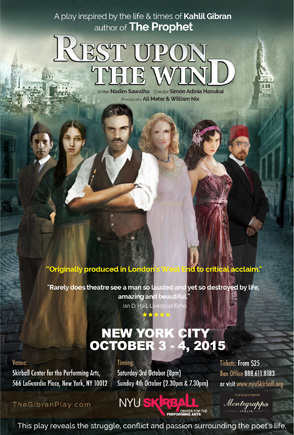 Rest Upon The Wind is inspired by Gibran's most famous book, "The Prophet". Nadim Sawalha's script celebrates the Arab sense of humor and family warmth through the relationship of Gibran and his sister Marianna as they and their family all struggle to survive in America. Memories of his childhood and own spiritual awakening in Mount Lebanon are juxtaposed with the everyday bustle and music of the Lebanese enclave in Boston's Chinatown, providing an insight into the poet's rollercoaster life and the people who had a great impact on it, especially two strong women in his life: his sister and Mary Haskell, his patron, mentor and romantic interest. ©2013-2018 Creative Projects Group, LLC. All Rights Reserved.